Arunachal Pradesh means the "land of the dawn-lit mountains" and lives up to its name with its pine-forested mountains that echo with the sound of the gurgling hill streams rushing down the slopes. Myriad tribes who still preserve their separate cultures, traditions and lifestyles inhabit this state, which has stayed in glorious isolation for so long in the state of Arunachal Pradesh. 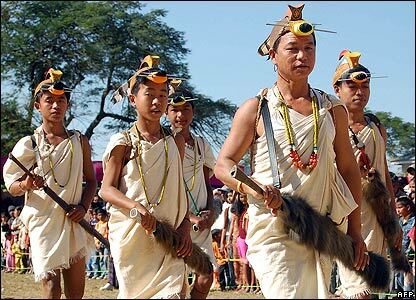 Home to a complex mix of communities, mostly tribal, Arunachal Pradesh is primarily a tribal society. The population is mainly of the Mangoloid and Tibeto-Burmese stock. The tribes range from slash-and-burn animists to the Tibetan Buddhist Monpa villages in the West and Thai people, the khampti in the East. The largest groups are the Adi in the Along area, the Misaimi in the ranges of North-East of Pasighat and the Nishi around Itanagar. There are about 20 major tribes divided into sub-tribes. The principal tribes are Adi, Nishi, Apatani, Tagin, Misaim, Monpa, Aka, Nocte,Wancho, Singpho, Tangsha, Khampti, Padma, Miris and Sherdukpen. The people in general are friendly, amiable and colourful. The tribal customs bind the tribesmen together into a solid community. The society is patriarchal and primogeniture. Fundamental laws of inheritance with variations are not uncommon. The tribes follow endogamy and strictly observe the rule of clan exogamy. Polygamy is socially sanctioned and practised most. The organisational Institutions administer the community and look after the welfare of the people.